Born into Brothels is the recipient of more than 25 major awards, including the 2005 Academy Award for Best Documentary Feature. A tribute to the resiliency of childhood and the restorative power of art, Born into Brothels is a portrait of several unforgettable children who live in the red light district of Calcutta. Zana Briski, a New York-based photographer, gives each of the children a camera and teaches them to look at the world with new eyes. Girl Rising is the culmination of six years of work by a team of former journalists from ABC News. They set out to investigate how to end global poverty (no small question!) and what they discovered was a simple, elegant truth: that educating girls is the highest-return investment you can make in breaking cycles of poverty. The desire to spread that truth led them to make Girl Rising. Nigerian Olympic hopeful Seun Adebiyi visited Sewickley Academy as part of the Sewickley Series in October 2011. He was one of the main characters in the film More to Live For, a story about three individuals whose lives were all shaken by cancer and dependent upon the one vital bone marrow match that could save them. Sewickley Academy Presents, "What Makes You Tic?" Have you ever considered the Chinese proverb, “live and let live”? Marc Elliot, author of What Makes you Tic, forced me to reconsider my understanding of this ancient maxim. I used to believe that this statement meant that people should simply mind their own business, essentially, “you do your thing and I’ll do mine.” However, after hearing Marc’s powerful presentation at PAISTA (Pittsburgh Association of Independent Schools) last year, I realized that this statement is actually a guide for daily leadership. It exhorts us to live our lives with sound judgment, which is the ability to critically analyze facts and information in order to form a sensible conclusion or opinion. It urges us to not be judgmental or display an excessively critical point of view, particularly when asserting the rightness or wrongness of things. Sound judgment is so important because our beliefs dictate our actions and our actions impact not only ourselves but those around us. On Thursday, February 2, at 7 pm in Gregg Theater, CMU professor and award-winning poet Terrance Hayes will read poems from his old and new published collections as part of the Sewickley Series. He will also present to Sewickley Academy Middle and Senior School students in an assembly during the day and conduct a poetry workshop with Academy and Summerbridge Pittsburgh students in the evening before his open-to-the-public reading. Join us for More to Live For and special guest Seun Adebiyi on Friday, October 21, at 7 pm in the Senior School Commons. The documentary More to Live For presents the story of three lives, all shaken by cancer and dependent upon the one vital bone marrow match that could save them. These individuals – 15-time Grammy winner and saxophonist Michael Brecker, founder of The Love Hope Strength Foundation James Chippendale, and Nigerian winter Olympic hopeful Seun Adebiyi – are similar only in their fate and prolific accomplishments. Their unrelated paths become connected in a desperate fight for survival and a singular mission: to bring awareness about bone marrow donation to the millions of people who could save a life today. 'Cast Party' Comes to Sewickley Academy! The Sewickley Series is proud to present a Silk Screen film series on women and Asian cultures throughout the month of January 2011! A Star Comes to Sewickley! Sometime in the early ’90s when I was still dancing in professional theater, I was in a production of Dreamgirls. The style of the music was quite a challenge for the musical director, so the show’s director and choreographer brought in an up-and-coming musician from New York to guide us through the musical rehearsals. The brilliant young man got the necessary sound from the cast. For years afterwards, I have followed the career of this musical genius and maintained a somewhat spotty connection with him through the occasional email. 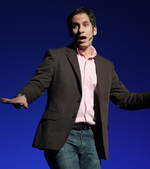 Now, probably 20 years later, I am thrilled to see that Seth Rudetsky is returning to Pittsburgh as part of our Sewickley Series! Since the Dreamgirls days, Seth’s career in New York has skyrocketed. I read his weekly articles at Playbill.com to keep track of his adventures. He’s played in the pit for 19 Broadway shows, wrote a couple of books, and has appeared both on Broadway and television as an actor. Aside from his musical genius, he is a walking Broadway encyclopedia. Seth is one of the funniest people I’ve ever met, and I can’t wait to see him perform live at SA!